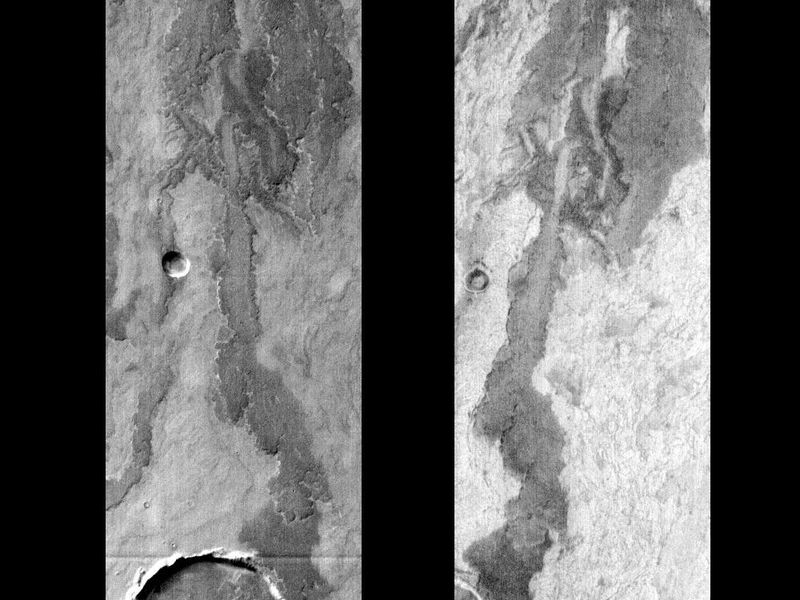 This pair of images shows part of Arsia Mons. 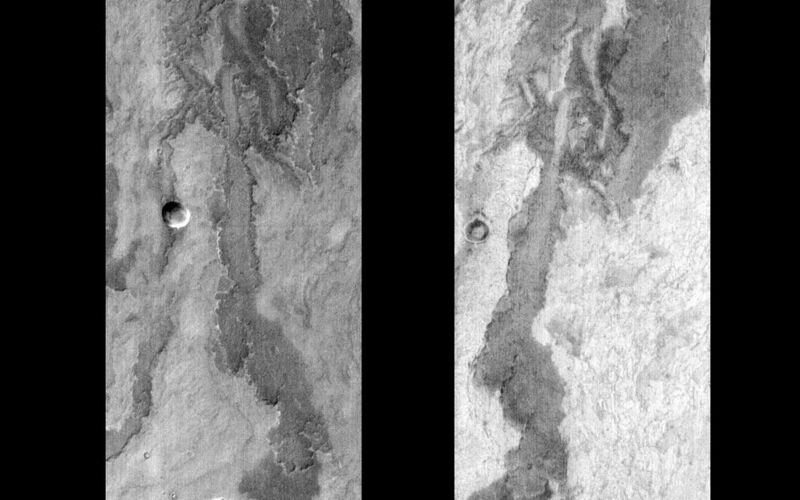 The image pairs presented focus on a single surface feature as seen in both the daytime and nighttime by the infrared THEMIS camera. 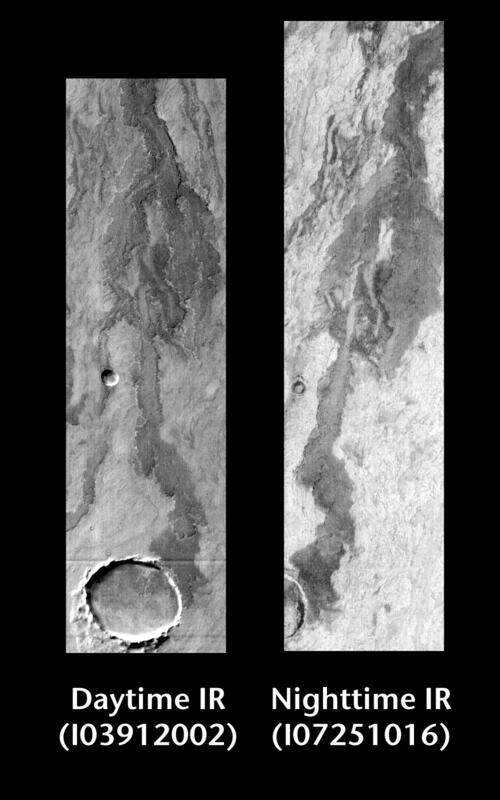 The nighttime image (right) has been rotated 180 degrees to place north at the top. Infrared images taken during the daytime exhibit both the morphological and thermophysical properties of the surface of Mars. Morphologic details are visible due to the effect of sun-facing slopes receiving more energy than antisun-facing slopes. 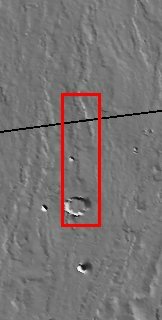 This creates a warm (bright) slope and cool (dark) slope appearance that mimics the light and shadows of a visible wavelength image. Thermophysical properties are seen in that dust heats up more quickly than rocks. Thus dusty areas are bright and rocky areas are dark. Infrared images taken during the nighttime exhibit only the thermophysical properties of the surface of Mars. The effect of sun-facing versus non-sun-facing energy dissipates quickly at night. Thermophysical effects dominate as different surfaces cool at different rates through the nighttime hours. Rocks cool slowly, and are therefore relatively bright at night (remember that rocks are dark during the day). Dust and other fine grained materials cool very quickly and are dark in nighttime infrared images. Image information: IR instrument. Latitude -19.6, Longitude 241.9 East (118.1 West). 100 meter/pixel resolution.